The MT-6PLUS is a premium surge protection solution for PCs and all electronics. It incorporates Tripp Lite’s exclusive Isobar surge suppression technology to stop strong surges before they can damage or destroy sensitive equipment. 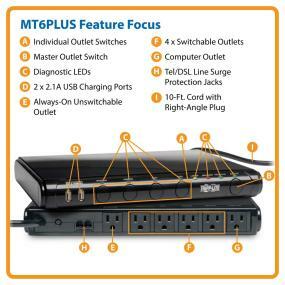 The MT-6PLUS has six AC outlets to connect peripherals, plus single-line tel/DSL line surge protection. Its low-profile, under-monitor design makes the MT-6PLUS easy to integrate into any home or office PC setup. A long 8-ft. cord enables connection to a distant wall outlet and a space-saving right-angle plug allows furniture to be placed flush against the wall. The MT-6PLUS’s 2 USB charging ports supply a total 2.1 amps of power—enough to charge the most power-hungry devices, including smartphones, tablets and MP3 players. Phone connections represent a potential back door through which a damaging surge could reach your equipment. The MT-6PLUS includes one set of built-in tel/DSL (RJ11) jacks to prevent surges from damaging your computer, fax or modem (one 6-ft. RJ11 phone cord included). More joules mean more protection, and the MT-6PLUS delivers with a high 3150-joule surge protection rating. When compared with other surge protectors, the MT-6PLUS’s substantially larger and more robust component array provides an effective, multi-layered defense against damaging power surges. Various electromagnetic and radio sources can cause disruptive interference on the AC line. This line noise is a common cause of incremental hardware damage, data corruption and performance problems. The MT-6PLUS uses exclusive isolated filter banks that prevent line noise and interference between components from causing computer lock-ups, data errors and similar problems. Isolated filter banks ensure that peripheral devices and appliances don’t degrade the performance of computers and other sensitive equipment. 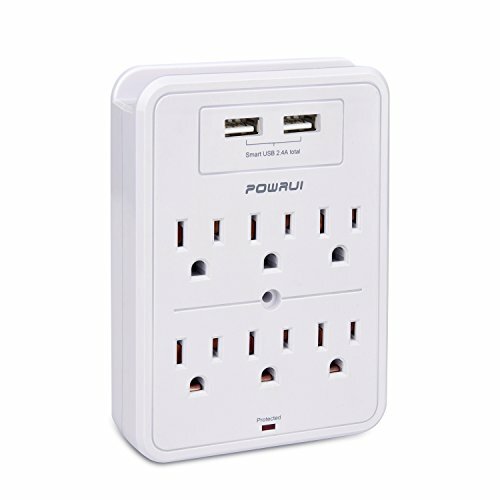 The MT-6PLUS has a total of 6 AC outlets—ample capacity for a desktop computer setup. Four outlets are individually controllable with their own On/Off switches; a Master On/Off switch controls these outlets plus one additional outlet; and the sixth outlet is “always on”—ideal for components that need to remain powered at all times (e. g., network modems and fax machines). This highly controllable outlet array gives you maximum flexibility in determining which components receive power. The MT-6PLUS uses a space-saving, low-profile design that makes it easy to integrate into your home or office computer setup. 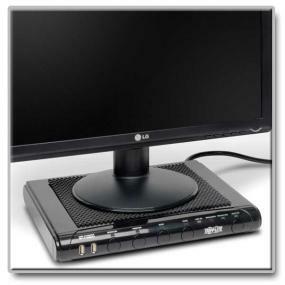 It installs neatly under the monitor, so that power switches are readily accessible and diagnostic LEDs are easily visible. Four diagnostic LEDs (LINE OK, GROUNDED, PROTECTED and MASTER On/Off) show power and protection status at a glance. 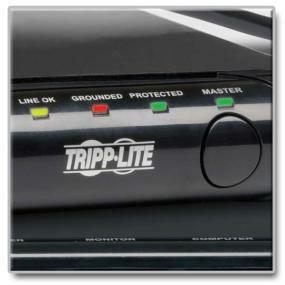 If the green PROTECTION PRESENT LED ever goes out, simply return the MT-6PLUS to Tripp Lite for a free replacement. The MT-6PLUS is backed by a lifetime warranty against damage due to surges, including direct lightning strikes (USA, Puerto Rico and Canada only) and comes with $100,000 of Ultimate Lifetime Insurance. As part of Tripp Lite’s commitment to environmental responsibility, MT-6PLUS is manufactured in compliance with strict RoHS specifications. 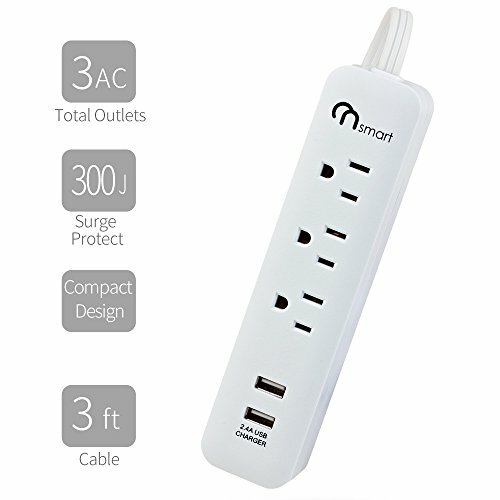 PROTECT ANY PC, DESKTOP COMPUTER & MORE FROM POWER SURGES & SPIKES: Low-profile, under-monitor surge suppressor provides three NEMA 5-15R AC outlets, 2 USB charging ports and one set of built-in tel/DSL (RJ11) jacks. 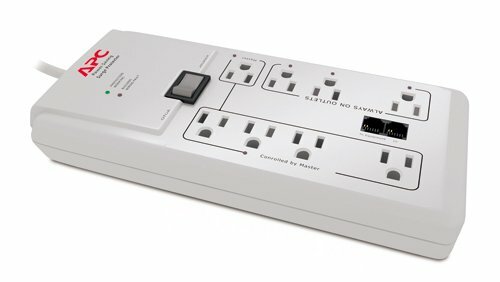 This surge suppressor can protect any computer, fax, modem, phone, tablet or home office device from dangerous power surges, spikes & line noise. Also known as: MT-6PLUS, MT6PLUS, MT6+. UNDER MONITOR SURGE PROTECTOR WITH INDIVIDUALLY CONTROLLABLE OUTLET SWITCHES: Features six AC outlets- four of which are individually controllable with their own on/off switches. A master on/off switch controls these outlets plus one additional outlet. The remaining outlet is “always on”-ideal for components such as fax machines that need to remain powered 24/7. LOW PROFILE METAL DESIGN & 8′ EXTRA-LONG CORD: Durable metal housing fits beneath monitor or laptop for convenient control at arm’s length. Power switches are readily accessible and diagnostic LEDs are easily visible. A 8-ft. cord acts like an extension cord to reach any distant wall outlet. LIFETIME WARRANTY, $100,000 INSURANCE: Lifetime Limited Warranty and $100,000 Ultimate Lifetime Insurance covers any connected equipment damaged by a power surge.